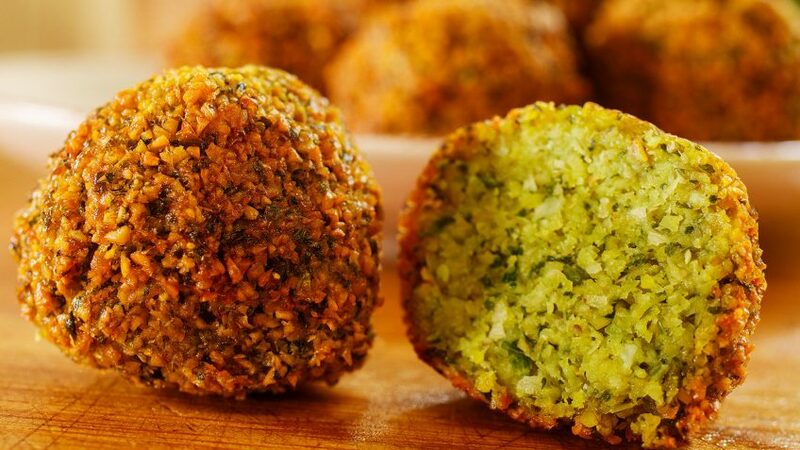 Arancini is an Italian word that means little orange due to the shape and colour of this food. 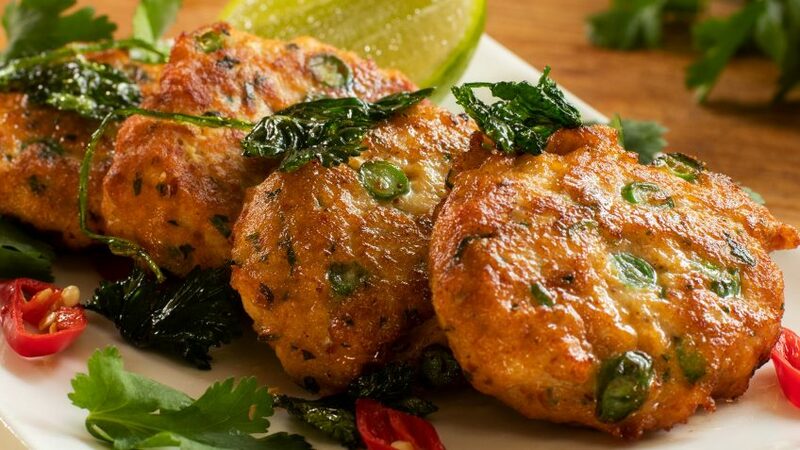 Arancinis have been around for a very long time, however recently increased in popularity as a finger food. The more common Arancini consist of a ragu meat and tomato filling. 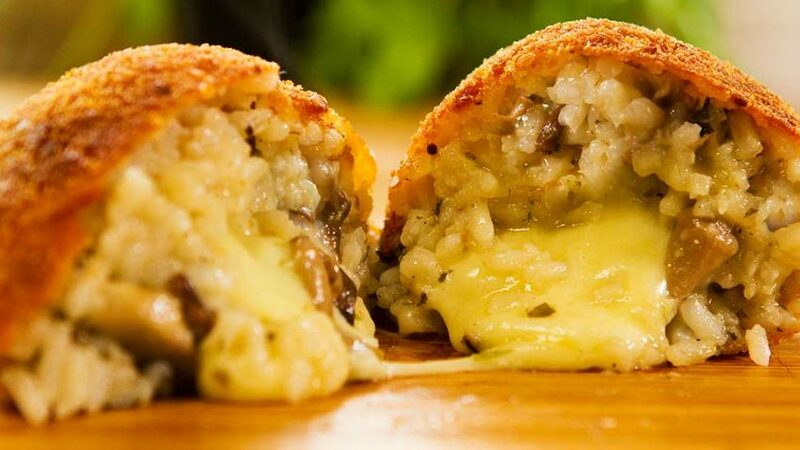 I call this one the simple Arancini as all you need is left over rice or risotto, cut up some mozzarella cheese, roll, crumb and fry. And what an amazing result. 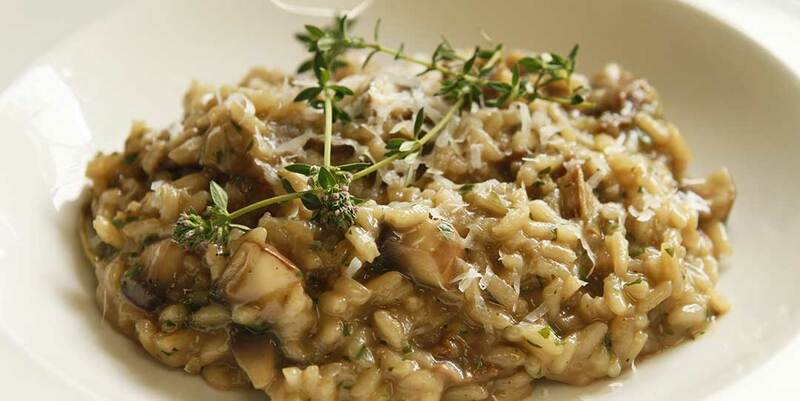 See my mushroom risotto recipe, for the complete recipe. 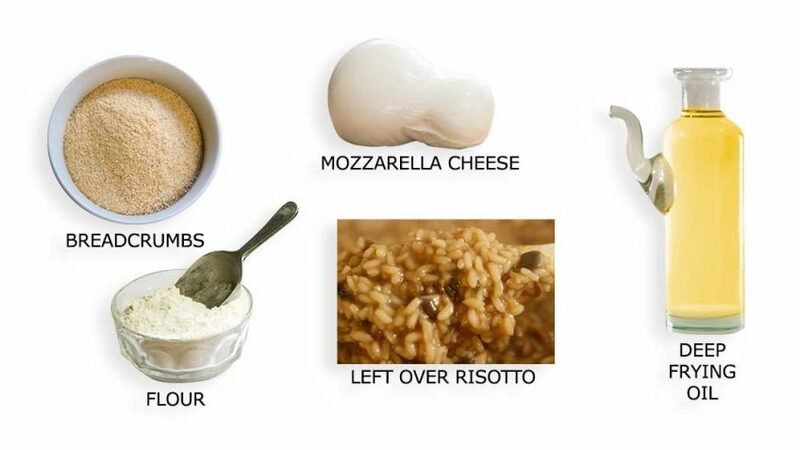 Note the measurements depend on the quantity of leftover risotto"
Preheat your deep fryer to 340°F – 170°C. Firstly arrange a crumbing station. 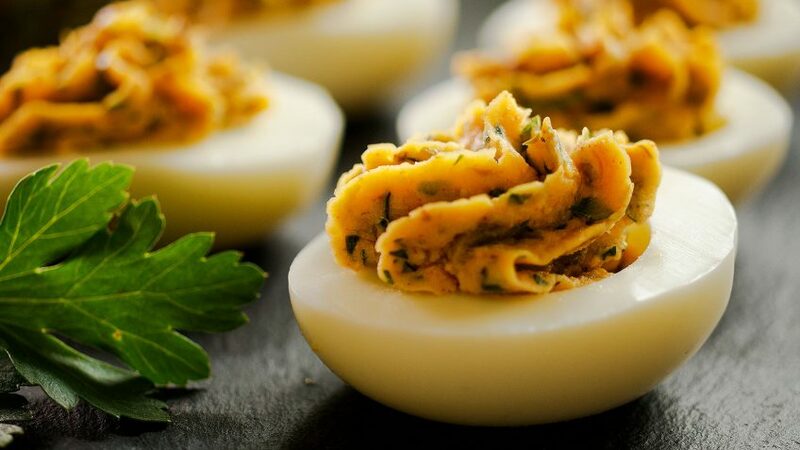 Crack two whole eggs into a mixing bowl and beat well. Using two plates or flat bowls, add approx one cup of flour in one and one cup of breadcrumbs in the other. Slice and dice into cubes the mozzarella cheese. Take the leftover risotto from the fridge, wet your hands under cold water or in a water bowl and using approx 3 tbsp of risotto mixture, shape into a ball. Press your thumb into the centre and using your fingers, shape into a cup. Place some mozzarella cubes, 3 or 4, not too many and enclose the cheese my moulding the rice with your hands. Roll into a ball using both hands. Roll each ball in flour, then eggwash then breadcrumbs. Roll the crumbed ball using both hands to pack and shape well. 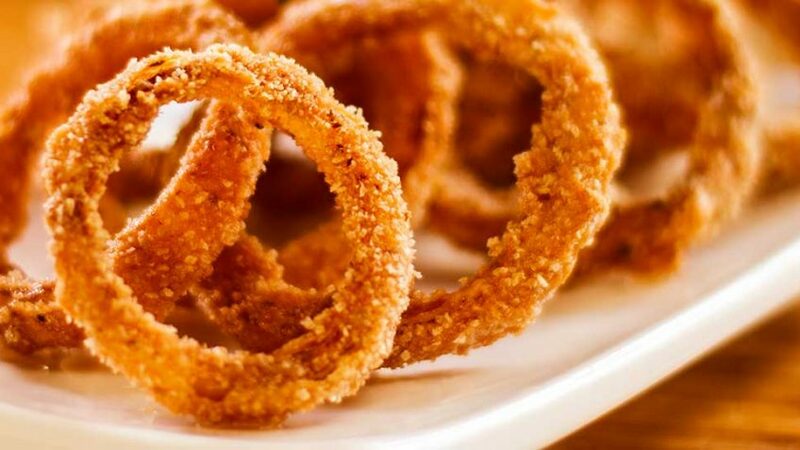 Deep fry for approx 5-6 minutes at 340°F – 170°C. 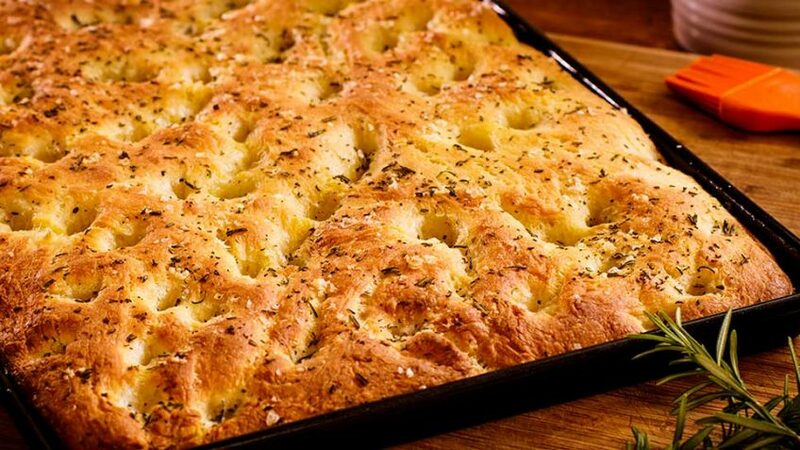 You can make them in advance, don't fry them quite as much and then simply reheat in oven.